Darrell Wallace, Jr. picked up the 1st last-place finish of his Monster Energy NASCAR Cup Series career in Sunday’s Pocono 400 at the Pocono Raceway when his #43 Weis Chevrolet fell out with engine problems after 108 of 200 laps. The finish came in Wallace’s 18th start. In the Cup Series last-place rankings, it’s the 37th for car #43, the 680th by reason of engine failure, and the 746th for Chevrolet. Across NASCAR’s top three series, it’s the 48th for the #43, the 1,056th by reason of engine failure, and the 1,600th for Chevrolet. It was in this same race, just under a year ago, that Wallace arrived on the Cup Series scene. At the time, the up-and-coming racer from Mobile, Alabama had worked his way through the Truck Series and XFINITY rankings, earning a full-time ride in Roush-Fenway Racing’s #6 Ford Mustang. The 2017 had been his third season in the car, and he sat 4th in the series standings after a strong start. But sponsorship issues led to the closure of the #6 team, leaving Wallace with an uncertain future. But another opportunity came just as quickly. So quickly, in fact, that Wallace’s final XFINITY start for Roush-Fenway would be followed the next day by his Cup debut. Following Aric Almirola’s back injury suffered in a terrible crash at Kansas, Richard Petty Motorsports was without their lead driver for two months. 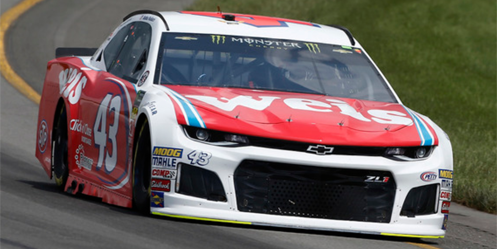 After a couple decent finishes by series veteran Regan Smith, RPM decided to try something different at Pocono, and tabbed Wallace to drive. He would become the first African American to start a Cup Series race since June 18, 2006, when Bill Lester took the green at Michigan. Wallace finished 26th that day, and soon after celebrated with friend and fellow competitor Ryan Blaney, who had just claimed his first Cup Series win. It was a poignant moment of the past meeting the future: Blaney drove the Wood Brothers’ #21 Ford, a ride just as iconic as Wallace’s #43. Wallace made three more Cup starts that year, each time improving on the previous finish. He ran 19th at Michigan, 15th at Daytona, then 11th at Kentucky before Almirola returned the next week at Loudon. When news broke of a falling-out between RPM and sponsor Smithfield, and that Almirola would be taking the sponsor to Stewart-Haas Racing to replace Danica Patrick, the ride once again became vacant. The team signed Wallace, who once again would have to cobble together sponsorship to fund his ride. Click ‘n Close Mortgages joined the team’s Daytona 500 effort, where RPM would debut their new Chevrolet Camaro, thanks to a new technical partnership with Richard Childress Racing. For the fifth time in as many starts, Wallace again improved. He finished a close 2nd to Austin Dillon, banging doors with Denny Hamlin across the finish line. Wallace’s Chevrolet was later sold at auction. Coming into Sunday’s one-year anniversary, Wallace sat 23rd in the point standings. While he hadn’t scored a DNF, he’d endured several difficult runs, including a late-race crash at Atlanta and a mechanical failure at Martinsville. But there were also flashes of brilliance: an 8th-place showing at Texas, a green-flag pass on Kyle Busch to lead six laps at Bristol, then another five laps out front at Talladega. New sponsorships arrived, from first-time backers like World Wide Technology to a returning Food Lion, plus several blue-and-red throwbacks to the STP machines of old. Pocono would see another of the former – Weis Markets – whose logos also adorned the 2.5-mile track’s scoring pylon. Wallace began the weekend 23rd in Friday’s opening practice. In qualifying, he made it to Round 2 with the 18th-fastest time, then ranked 19th in Round 2 with a lap of 173.708mph (51.811 seconds). He was then 23rd again in Happy Hour. With 38 cars entered for 40 spots, no teams were sent home after time trials. Starting last in Sunday’s race was Derrike Cope, who was making his 23rd Cup start at Pocono. The race would also see the return of his StarCom Racing’s second team, the #99 StarCom Fiber Chevrolet, which was wrecked midway through last month’s round in Dover. No teams incurred pre-race penalties sending them to the rear, nor did any other teams fall back voluntarily. This meant that Cope would line up next to 37th-place starter J.J. Yeley. Yeley, tabbed to drive in Johnathan Cohen’s return to Cup team ownership, was again behind the wheel of the team’s #7 Steakhouse Elite Chevrolet. During the week, however, the car had been withdrawn by Cohen and re-entered under the team’s partners at Premium Motorsports, meaning that Premium’s owner Jay Robinson would earn Yeley’s Owner Points. When the green flag fell, Cope inched ahead of Yeley heading into the first corner, but Yeley pulled back to his inside in Turn 1. Yeley then got the drive off and began to work his way past Cope through the tunnel turn before finally clearing him in Turn 3. Cope then fell into line, where he could see Yeley work his way past Cole Whitt in TriStar Motorsports’ #72 Chevrolet. Cope would stay in the last position for most of the afternoon. On Lap 4, he was 15.8 seconds back of the leader. He reported the car was tight, but was trying not to overuse the brakes. By Lap 8, Cope’s car had turned loose both on entrance and exit, and he continued to lose ground to the rest of the field. By Lap 12, he was entering Turn 1 as the leaders came off Turn 3. Four circuits later, Cope pulled to the inside off Turn 3 as race leader Kevin Harvick motored by to his outside, the #99 now the first car one lap down. At this moment, just as Ryan Blaney began a sequence of off-cycle green-flag pit stops, Cope’s crew discussed how they were going to keep their driver hydrated. The #99 didn’t have a cupholder in it, so the crew would have to hand him a water bottle with a straw in it, then instruct the driver to toss it out at the end of his stop. During these stops, Cole Custer took last on Lap 22. Custer was making his first Cup start since his series debut at Las Vegas in March, again driving a Stewart-Haas Racing prepared #51 Ford entered by Rick Ware Racing. Cope retook 38th by Lap 25, then lost a second lap after his own stop for tires, fuel, and water. Cope lost his third circuit on the 44th lap, which allowed Martin Truex, Jr. to use him as a pick in order to pass leader Harvick. Cope finished Stage 1 three laps down and had planned to fall to the tail end of the field for the start of Stage 2. However, when the green flag fell, Cope was surrounded on all sides by several drivers, including Cole Whitt, Kasey Kahne, and teammate Landon Cassill. J.J. Yeley was also having difficulty finding a clear place to run, and on Lap 60 pulled his car close to the grass in Turn 1 to let the leaders pass. Through it all, Cope said his car was “definitely better” and that he could “definitely drive it harder.” But the overall pace was still not there. He lost a fourth lap by Lap 61, then a fifth after his next stop on Lap 78. Cope lost a sixth circuit by the time Stage 2 ended. As Cope prepared his adjustments for Stage 3, Darrell Wallace, Jr. was having an up-and-down day. 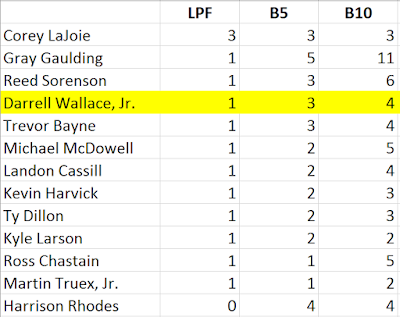 The variety of pit strategies allowed Wallace to stay out longer during Stage 2, and he paced the field for four laps. Once he made his stop, Wallace was then caught speeding off pit road, and NASCAR waved the black flag with the white cross, indicating he would no longer be scored if he didn’t serve the pass-through. Wallace served the penalty on Lap 89, and lost a lap in the exchange. In Stage 3, he was working his way back through the field, and was running in 27th when a rookie mistake ended his day. On Lap 108, he shifted down from third to second on a straightaway, blowing the engine. Wallace limped down the short chute and made it to pit road, then pulled behind the wall. He took last from Cope on Lap 116. Finishing 37th was Matt DiBenedetto, whose right-front wheel on the #32 Zynga Poker Ford erupted in flames, forcing an abrupt turn to the garage on Lap 117. Unable to find a replacement brake caliper in time, the Go FAS Racing team called it an afternoon. It marked the second-straight Pocono race where the #43 and #32 finished in the bottom two positions, following both cars’ involvement in a first-lap fracas that led to a scoring issue last July. 36th fell to Kasey Kahne, whose #95 FDNY Foundation Chevrolet tore out the transmission moments after DiBenedetto’s exit, forcing a hard left turn at pit exit and into the garage area. 35th-place Denny Hamlin was the only driver eliminated in a crash, the result of a tangle with Alex Bowman in the first corner on Lap 148. Rounding out the field was Derrike Cope, eight laps down to the leaders – no thanks to contact from Kyle Larson that sent him into a spin off Turn 3 on Lap 126. Unlike Dover, Cope managed to leave the track with his car intact. *Wallace is the first African American to finish last in a Cup Series race since September 20, 1970, when Hall of Fame driver Wendell Scott lost an engine on his #34 1969 Ford after 1 lap of the Mason-Dixon 300 at Dover. It was the 12th and final last-place run of Scott’s career. *This marks the first streak of three consecutive first-time last-place finishers since Races 2 through 4 of 2017: Cody Ware (Atlanta), Corey LaJoie (Las Vegas), and Jeffrey Earnhardt (Phoenix). 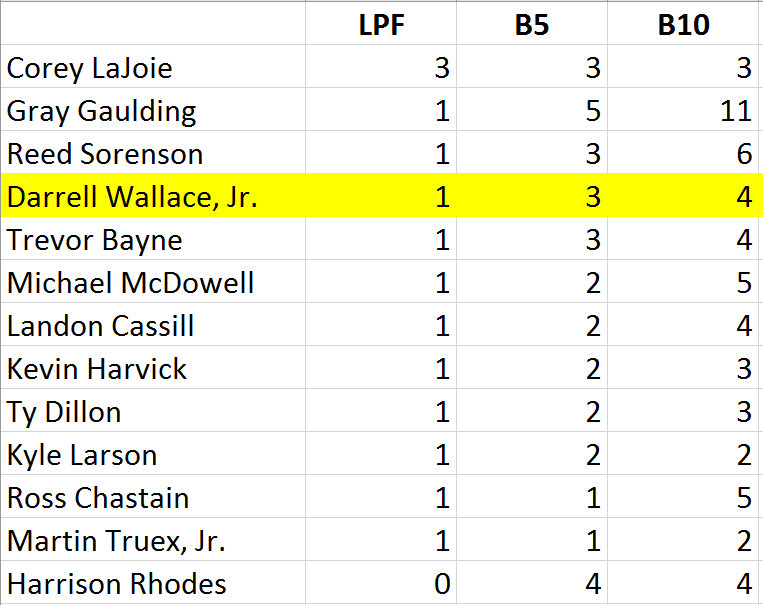 *Wallace is just the third Cup Series driver to lead at least one lap at Pocono, then finish last. The other two were Todd Bodine on July 29, 2001 (2 laps led) and Michael Waltrip on August 3, 2008 (1 lap led). Wallace’s four laps led are the most by any driver in this category. *Wallace’s 108 laps are the most completed by a first-time last-placer at Pocono since June 12, 1983, when Bobby Gerhart ran 44 laps of the Van Scoy Diamond Mine 500 before engine trouble. It’s the sixth-most laps complete of any Cup Series last-placer at Pocono. Statistics are fine but what difference does it make that Bubba was the first black to finish last since 1970? Why do I need to know that? The NFL writers don't publish statistics of the most TD passes by "left handed white players". Just stop it. The statistic doesn't need to mean anything to you, and it is certainly not intended to be anything offensive. Darrell Wallace, Jr. has himself been very candid about being the first African American NASCAR driver in years and has tweeted that he has embraced that role. He also has close ties with Wendell Scott's family, who have supported his efforts. My statistic offered another opportunity to feature both Wallace and Scott, which I felt made an interesting story. It also gave me a chance to link my earlier feature on Scott's 1970 finish. That said, I also recognized there was no need to stretch the topic further. Would it be relevant to point out he was the first African American to trail a race at Pocono, etc.? No. I also wanted to make sure I approached his driver profile the same way as my others, describing him as a competitor irrespective of race.